Grand Velas Riviera Maya has been member of the Leading Hotels of the World since 2009, recognized as AAA 5-Diamond property since 2010. Diverse upscale accommodations options include uniquely exotic jungle and ocean view suites; luxury suites have been carefully designed to complement our naturally breathtaking surroundings and seduce your senses. The Zen Grand ambiance, immersed in the natural environment of the Mayan jungle, this family-friendly features elegantly exotic suites and more than 1000 square feet of space including a beautiful terrace with jungle view. The Ambassador ambiance, also a family-friendly area with suites that arranged around the main infinity pool and have a spectacular ocean-view terrace. The exclusive Grand Class section; designed for optimum privacy and relaxation. Features suites with oceanfront view, created to experience an intimate ambience. Enjoy high-end amenities like a private plunge pool on the terrace overlooking the blue waters of the Caribbean; the spa-like bathroom also features a Jacuzzi tub and rain shower. Grand Class ambiance is an Adult Only area which welcomes teenagers starting from 16 years old. The resort’s fine cuisine includes several restaurants and bars, two with 4 Diamond certifications. We also have the first restaurant in the world to be part of an all inclusive and received a 5 Diamond award by the AAA; from emotional cuisine to contemporary takes on traditional French dishes and Asian specialties. The bars opened day and night offering Domestic and International Premium Brands. 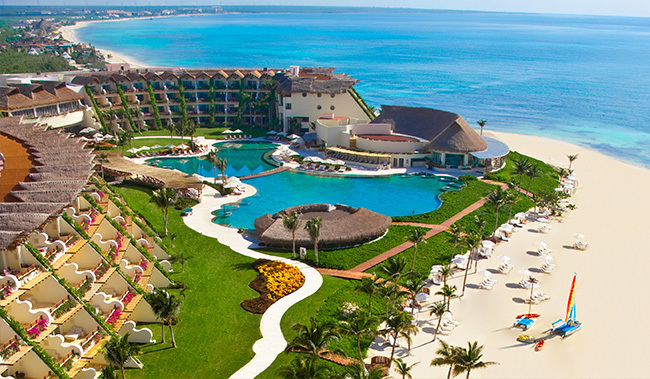 The Grand Velas Riviera Maya Spa was named “Best Spa in the World” by Virtuoso in 2010. Located in the heart of the property, the Spa covers an area of more than 89,000 square feet, containing 40 treatment suites appointed with beautiful native artwork and separate hydrotherapy facilities men and women. It brings a unique sensory journey of wellness and relaxation and offers a hydrothermal journey. This resort goes above and beyond offering a vacation of a lifetime. Every season, kids are treated to educational, athletic and artistic opportunities at the Kids Clubs with special activities programs. The Teen’s Club is a chilled place for the youngest to sing karaoke and play videogames, pool, ice hockey, ping-pong or board games. Entire families will have the opportunity to enjoy a nightly themed shows and dinners. Complimentary one-way private airport transfer ( From Airport to the Hotel ) . Must be arrange at least 48 hrs prior arrival through our Virtuoso Specialist at virtuosospecialistrm@grandvelas.com, one transportation confirmed per family (booking) arriving together. SPA Credit: $ 50 USD per person, per night SPA Bonus applicable on massages, facials and body wrap treatments with a duration of 50 min or more (Not transferable between guests, Not cumulative, Not redeemable for cash, Unused balances will not be refunded, Not combined with other Spa promotions, Not applicable on SPA Boutique products, Beauty Salon, Hydrotherapy Circuit, Not applicable on treatments available in SPA Cabanas (outdoor areas at Ambassador), Applicable on treatments with a duration of 50 min or more.